Most replacement battery meter utilities take the information overload approach. Details run to multiple decimal places, and reports lay hidden behind obscure menu items, harboring deep secrets that require mouse-click symphonies to extract. Since laptops are factory-equipped with basic battery monitoring software, third-party toolmakers compensate with a checklist of features designed to justify forking over the dough for something you already have for free. While this works well for all concerned, there is another approach: Make simplicity and directness a virtue, along with a heavy dose of style that makes using the software a pleasure. FatBatt takes the latter route and, despite a steep price tag, brings along an honest charm that sets it apart from its better-educated brethren. Looking over MiserWare's website for FatBatt, you get the impression the company is acutely aware of its freshman status in the laptop road warrior's heavily tribal world. The company makes no effort to obscure the tiny size of the team or the playful personalities behind the software. The company blog bubbles with freeform poetry about the product, feelings about questionable website layouts on popular download sites, and odes to the hometown of the six-person startup company. That same personality is on display in the software too, with witticisms in the options window and elsewhere. Alter the processor speed or screen brightness, and FatBatt adjusts the time estimates on the fly. All this makes for a great first impression, but the slick, plot-graph interface is FatBatt's main attraction. It maps time and charge on a small graph that pops up when you click the FatBatt gadget near the clock on the taskbar. Conservative and optimistic estimates of remaining time create a shaded area on the graph that projects your battery life expectancy. 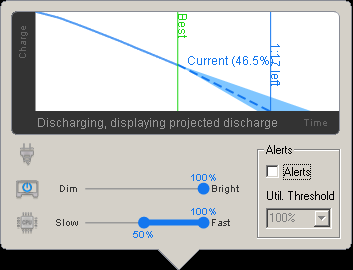 As the software collects further information from system loads and usage habits, this shaded area narrows, indicating improved accuracy due to more precise information. FatBatt's estimates often vary quite a bit from the optimism on display with built-in battery gauge software, sometimes on the order of an hour or more. While FatBatt isn't deep software by nature, tests with an A10–4600M AMD laptop system using a variety of mixed-load software indicate results far more accurate than manufacturer- or OS-supplied solutions, usually to within 5% or so of reality. 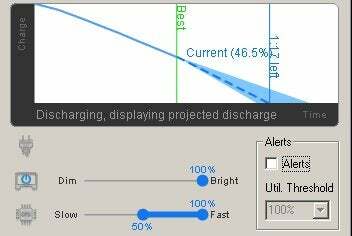 A carefully selected set of power-conserving options are available on the graph screen, including screen brightness control and a slider to set processor speed. As you adjust these, you can see the change in battery life immediately reflected in the estimates on the display. Cut MHz or ease the backlight and the extra minutes materialize. This feature alone makes FatBatt worthwhile. Also included are customizable alarms that let you know when background processes are running roughshod over your battery's power budget before they turn you into a wall outlet nomad. The team's personality is on full display in the software options window. There's a catch, however. This boutique software comes at a top-shelf price. 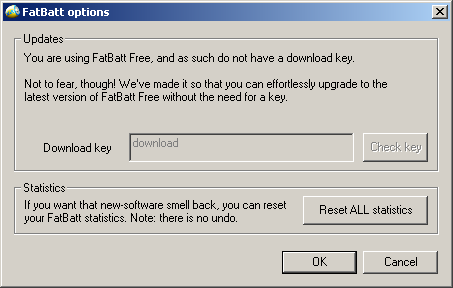 With just a 14-day trial between nothing and the full version, you have to pay to appreciate FatBatt's charms for any length of time. MiserWare softens the $15 asking price with frequent discounts, but a more reasonable starting number would make recommendation an easier choice. As it stands, rival packages like BatteryCare give you more for free, but FatBatt's great interface and the cool team behind it may sway your affections, regardless. The trial version is blissfully free of adware chicanery, so if you spend a lot of time away from the charger, it's worthwhile to give it a try. FatBatt's style and accuracy make this battery utility worth a peek.